At the forward end of the long hood, there is no grille. Air is ducted to the radiator through a scoop hidden below the slender, blade-like bumper. 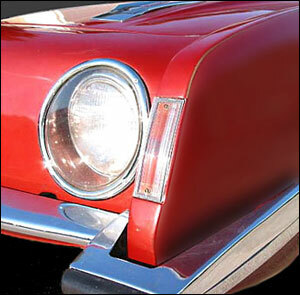 The hood is a simple, angular shape with no embellishments other than single headlights set slightly inboard and a tapering, hard-edged asymmetric rise starting with the Studebaker logo surrounded by a chrome panel and extending back to form a cowling that meets the interior instrument cluster. 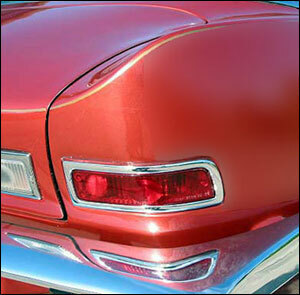 Fenders are severely indented at the body's mid-section. From belt line to rocker, the panels are curved inward, forming what is called a coke bottle curve (or coke bottle contour). The roof and tail are tapered to meet in a bobbed fast-back and the quarter panels merge into the deck with a dramatically swooping curve. Forward thrust of wedge-shaped front. The swooping curve of bob-tailed rear.